After three days amidst the urban sprawl of Beijing I was ready for an opportunity to breathe some fresh air into my lungs. This desire was more than amply fulfilled by the next stop on our itinerary: two hours drive to the north of the city, to a small guest house in a village called Gubeikou beside the Great Wall. My original objective was to find a part of the Great Wall away from the most touristy areas (where the Wall is, in any case, largely a reconstruction rather than original). 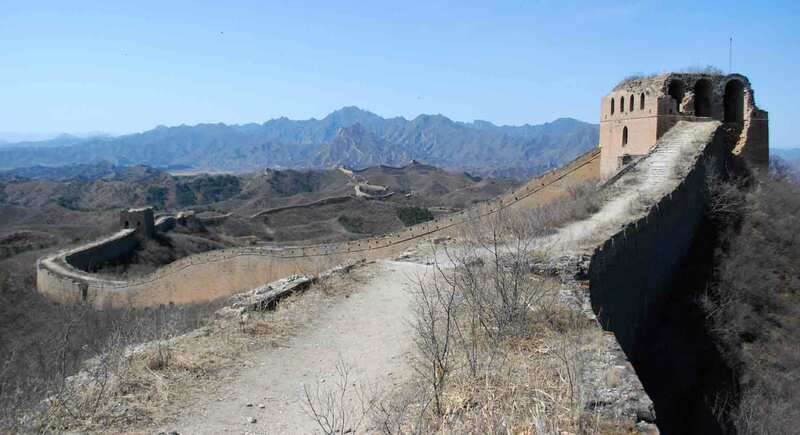 Gubeikou surpassed that expectation: the scenery was fantastic and, apart from a custodian, who collected a 25 Yuan fee from us at an isolated milecastle, we walked the wall in complete solitude. Whenever we paused for breath, we could see the wall snaking across the rugged terrain for as far as the eye could see in both directions. The scale is staggering: I live close to Hadrian’s Wall in the north of England, which is 118 kilometres long; the Great Wall, by comparison, extends for 8,850 kilometres: 75 times further. 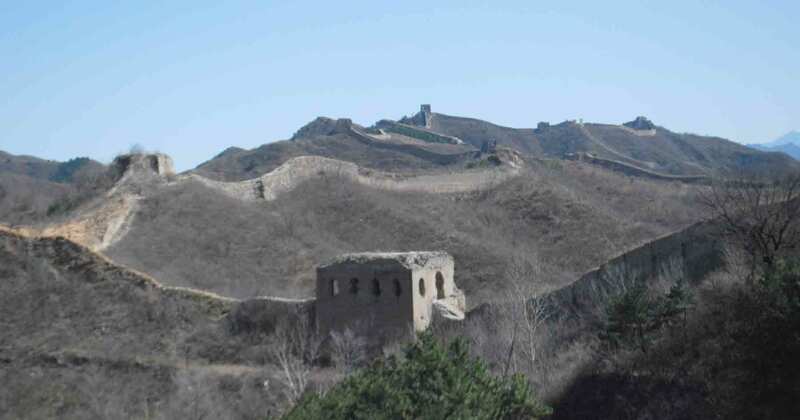 The oldest parts of the Great Wall were 700 years old when the Romans started building Hadrian’s Wall, although most of what we see today dates from the Ming Dynasty (14th century). Our circumstances – alone in this vast landscape but with the wall ever-present to determine our path – created near-meditative conditions, giving me ample space for my mind to roam and reflect. Last year I read Nick Lane’s excellent book The Vital Question in which he explained how the membranes around cells are used generate the energy that the cells need. This, in turn, is necessary if we are to understand how – and where – life evolved. Nick Lane managed to do this in a way that I, who had been turned off biochemistry at school and university, could understand. I read his book, however, at the time that tens of thousands of migrants were flowing across Europe, and the analogies between the semi-permeable membranes around cells and the more-or-less permeable borders around countries were hard to avoid. The Great Wall is nothing, if not a border, yet this is not just a means of excluding people: borders can also help to define the identities of those inside and, by controlling what comes in and out, influence the economy. Cells generate energy by maintaining gradients across membranes such that the electrons from which that energy is derived flow naturally into the cell. Maintaining this differential is essential if the cell is to keep conditions inside favourable. And so it is for countries and their borders. Any flow depends on a differential, and the movement of migrants is no different. There are economic migrants (differential in income), refugees from conflicts (differentials in security) and hybrids of the two. As last summer wore on, political rhetoric also flowed yet reason, I realised, was largely on the side of the migrants. There was an inevitability to their movement that the political Right, in particular, just did not get. I had sympathy with the UK government’s policy of putting money into support for refugees in the middle East. Reduce the differential (i.e. make people feel more secure in the middle East) and the flow should dwindle; however, the momentum last year was too great and the efforts too late. I had great respect for Angela Merkel and many Germans who were prepared to welcome migrants. But there are many in Europe – including the UK – who see the solution only in terms of reduced permeability of borders. What events of the past year have shown is that national borders are flimsy membranes that take great energy to maintain and which have the potential to generate enormous tensions. Yet these same economic consequences reduce the differential, and that is one way that the flow of economic migrants to Europe will be slowed. On the other hand, acknowledging that the flow of migrants into a region will have economic consequences is offering the advantage to the nationalistic elements who play on the fears of populace. These thoughts were put into context by yet another excellent book, Peter Frankopan’s The Silk Roads, which outlines the long history of east-west movement of people and trade between Europe and Asia, and their consequences. It helps us set the movements we have witnessed over the past year or so into a much broader historical perspective, partly by emphasising how transitory many national boundaries are, but mostly by illustrating how many other mass migrations have taken place over time. Some were generated by natural events such as famines; others were the consequences of human actions (the Mongol invasions are a good example). Once again, we see disequilibria in security or basic human needs precipitating movements that seem to be almost unstoppable. The problem is that such events are sporadic, once a century or less and, as such, difficult to learn practical lessons from. Our politicians, with their typically short-term vision, enter crisis mode if it happens on their watch, then try to hold back the flow, rather than adapt to the inevitable. Frankopan, P. (2015). The Silk Roads. A New History of the World. Bloomsbury, London. Lane, N. (2015). The Vital Question: Why Is Life the Way It Is? Profile Books, London. 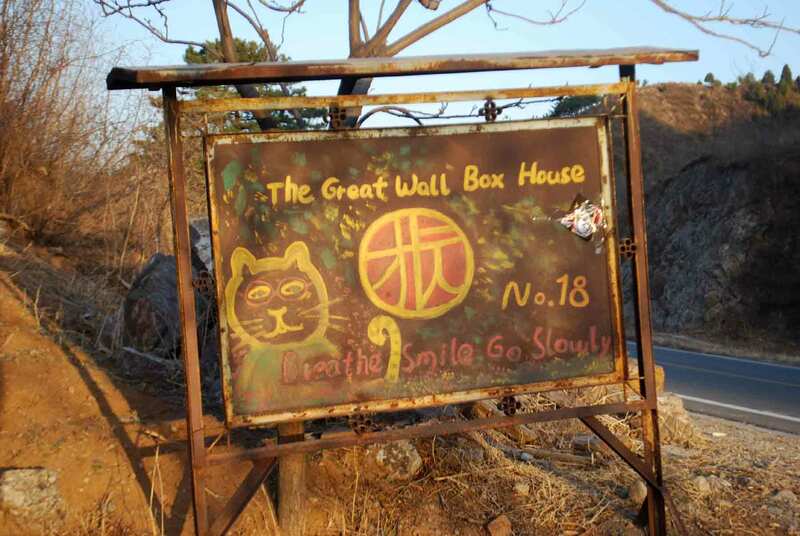 Finally, our accommodation in Gubeikou was at the Great Wall Box House, which we can thoroughly recommend. One wall of the courtyard is, in fact, part of the Great Wall itself. The rooms are clean and comfortable and they provide excellent vegetarian food and advice on the best routes to explore the Wall in the vicinity. Ah Martyn – what memories and brilliant ‘photos 😁👍 I did read the article too ! I was out to dinner last night and impressed them with my pics ! Warmer today and sunny. Hope all good with you all.